Deltas of the Carboniferous period were heavily forested and Britain, at the time had an equatorial climate of high temperatures and heavy rainfall. Plant species however were quite different from those of the tropics today. 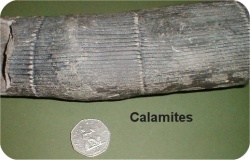 The fossil, pictured right, is of Calamites, a tree fern. It was similar to the horsetail family of today but grew up to 15m high, as did many other species then. Seed ferns, such as Neuropteris which often fossilise beautifully with fern-like leaves were then abundant but are now extinct. Club mosses, such as Lepidodendron characterised by spores held on cones, also grew to large sizes. For plants to become fossilised, rapid covering with sediment or sinking into the stagnant water of the delta marshes is necessary. This prevents organic material in the plant being lost to the atmosphere as carbon dioxide. 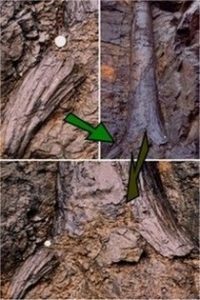 Leaves may be well preserved in fine grained mudstones and shales, but are broken up during turbulent current action, with leaf fragments found as black flecks in sandstones, a characteristic feature of the Rough Rock. Leaf fossils An impression of a leaf or branch is often represented only by a black carbon film. Trees and branches brought down by heavy floods and stranded on sandbanks are sometimes preserved in cross-bedded sandstones. Roots and rootlets are often preserved in the soil and sand in which they grew. Quartz rich soils lithified to produce a tough white sandstone called ganister, frequently containing black rootlets in situ. Many local sandstones contain plant fossils so a search of quarries is often rewarding. 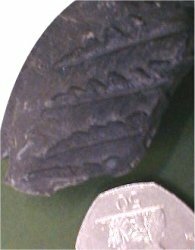 Coal Measure shales, to the east of the Huddersfield district, sometimes have leaf and branch fossils. Ganister with black rootlets A large Stigmaria tree-trunk found at Hoyles’ Quarry, Crosland Hill in 1962, stands at the entrance to the Tolson Museum, Ravensknowle Park, Huddersfield. 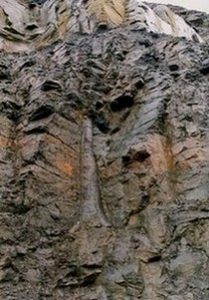 Here are some examples we have seen in local quarries. For more information about the Rocks and Landscapes of Huddersfield see our other pages on Local Geology and our guide to the Geology of Huddersfield.